Buy this phone from Wirefly for free after rebate. 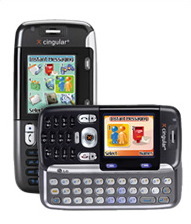 Cingular today added the LG F9100 to the lineup. The LG F9100 has a unique slide out QWERTY keyboard that makes it somewhat of a competitor to the Motorola A630. While the F9100 was officially announced at CES earlier this month, the FCC posted documents about it in late December 2004. Features of the F9100 include: * Slide-out keyboard * 65K color 128x160 pixel display * IM * Java 2.0 support Cingular is currently charging $149.99 for the phone along with a 2-year activation. But you can snag it from Wirefly for free after rebate. The website notes that the device was recently featured on American Idol.